"Abou Helal", Dairat Al Maaref, by Dr. Fouad Ephrem EL BOUSTANY, volume five, Beirut, Catholic Printing Press, 1964. "Al Amr al Ilahi wa mafhoumih inda al Ismailiin", Researches, volume 1 (1967), Beirut, American University of Beirut. "The Philosophical Concept of the Imam in Ismailism", Studia Islamica, volume 27 (1967). "Al Hakim bi-Amr Allah Appointment of his successors", Al-Abhath, volume 22 (1970). "God and Man in the Druze Faith", Prabudha Baharata (India), vol. 7 (1970). "Arabic Literature", The Joy of knowledge Library, edited by James Brazeley, volume 1. "Les Druzes", Lumières: Encyclopédie Thérmatique et Analogiques, Beyrouth, Joquart editeurs, 1980. "Bannou al Jarrah", Chronicle of Arabs and the World, Beirut, 1986. "The Druze Faith", Conference at St.Anttony College, Oxford, 2002. 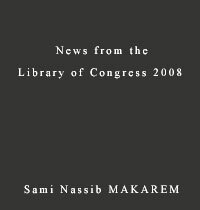 Books & forewords by Sami Makarem.